1922 | Buried words and Bushwa. Sometimes it’s safer to just not ask questions…. After yesterday’s post, featuring a picture of what was reported to be a head hunters weapon (long pole, noose, pointy spike, make of that what you will…. ), a few of you were curious to know just how a head goes from the shape we all know and quite frankly, prefer, to a shrunken trophy displayed for all the other head hunters to admire. The actual shrinking of the head seems to be quite an involved process, one I am sure wasn’t stumbled across on an idle rainy afternoon, so how many goes do you think the original shrinker had at it before he got it right? Ick…. 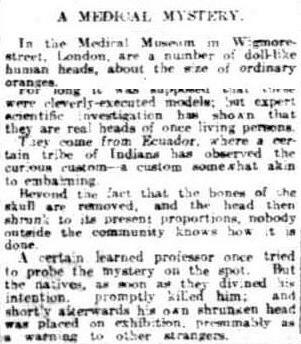 Throughout history humans have always liked to put their enemies heads on display haven’t they? Generally it was just enough to stick them on a spike and put them in a prominent position near your hut or castle though! This article from 1922 tells us that we aren’t the first to wonder about the method, but thanks to the interwebs we are lucky enough to be able to find the answer from the safety of our couch. Race cheat. 1922. Oh, and today….. Yes, today is the day we are going to suffer through what will no doubt be constant media coverage of Lance Armstrong’s self-serving tell-all to Oprah. I think you can guess from that sentence what my opinion is of the situation. 😉 I am not a fan, and really, if Lance thought having a cry on Oprah’s shoulder would make it all right with the world I expect that he is in for a rude shock. Are there any of you out there who think telling a friendly TV show host you are sorry is making proper amends for a crime involving many millions of dollar and world-class lying? No? Didn’t think so. I have been interested in the endlessly repeating clip we have seen of Oprah since she conducted her interview. The media has loudly proclaimed that Lance admitted to doping but I have not once heard that from Oprah herself. Maybe I missed it? I am sceptical of Lance actually taking responsibility for everything though. I have a feeling that he skirted around the issue and hinted that it might have gone on but didn’t state in black and white that he was a drug cheat. 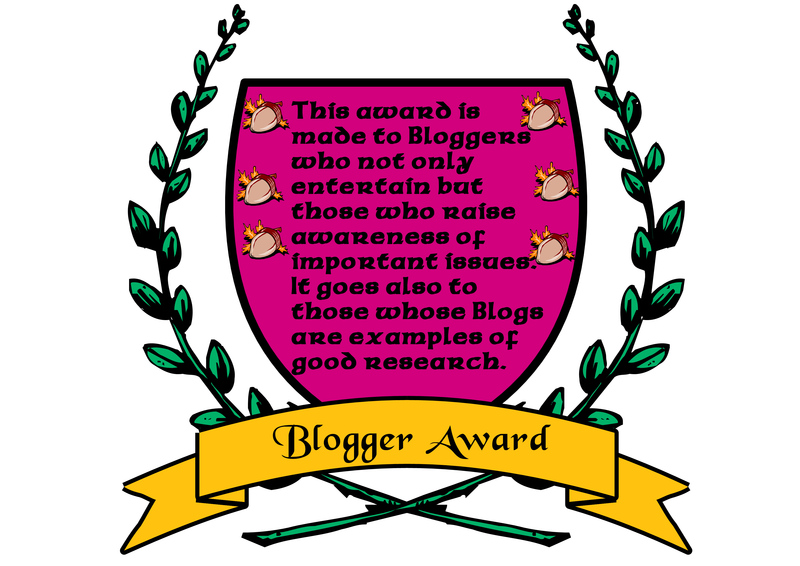 Oh well, by the time many of you read this it will be out in the public domain and I might be horribly wrong…. If he does admit to doping over the years I wouldn’t recommend any of you get in the way of the hordes of lawyers stampeding to file suits against him. Many of his (as do other professional riders) contracts have an annoying little clause that meant any drug use would mean the end of the contract and the return of his fees. Ouch. I am mainly annoyed with the fact that Lance seems to only be trying to wipe the slate clean in order to start up some other kind of sporting career. He needs to get everyone off his back about the ignominious end to his cycling career and he thinks Oprah is the key. That isn’t really a heartfelt “I done you wrong” type of apology is it? It seems more of a “I wish you’d just forget about it already!” apology. Does he really think anyone will ever be excited to see him perform at a high level again? Any future successes will hardly be taken seriously, will they? Who would you have liked to see interview Lance, any suggestions? Oprah isn’t really known for her hard-hitting style is she? Lance wouldn’t have even lasted 5 minutes in the red chair with Graham Norton without the lever being pulled, and then at least there would have been more interesting interviewees ready for the rest of the hour. I haven’t written about sea monsters for a while so when I found this article I just had to share it with you. In 1922 a ship steaming along the west coast of Africa found itself entering and area where a terrific battle seemed to have taken place. None of the sailors knew what had caused the carnage, but suspected that the whales had been attacked by swordfish. Can you imagine what it would take to cause such a massive and terrible scene? Miles of blood-red sea and hundreds of dead whales is certainly a sight that would be hard to forget. I am not sure if whales and swordfish are usually deadly enemies though, I thought that only sharks or killer whales attacked whales. A little more looking around and I found an article from the Wanganui Chronicle in New Zealand from 1908 about a battle witnessed by sailors between a swordfish and a whale with a calf. After much thrashing about the whale managed to use its tail to stun the huge swordfish who was then hauled on board the nearby boat and taken off to Auckland to be frozen. I wonder what kind of horrific battle (sharks, Orcas, swordfish….?) there was to have left such carnage in the path of Captain Poole’s ship. Imagine if they had sailed through the area a little earlier and been caught up in it. Perhaps there would have been no-one left to tell the tale….. Some of you might remember the wolf posts I did a while ago that taught us all to avoid hungry wolves at all costs, especially if you are a bridal party or in a train. Well, this time the wolves aren’t attacking a party of people in sleds or a train crew clearing snow. This lot seems desperate enough to have attacked a moving train. 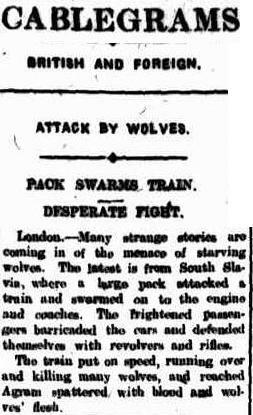 When the wolves swarmed over the engine and coaches the passengers barricaded themselves in and defended themselves with guns, the driver putting on speed to make an escape. Clearly this group of survivors were a little more chivalrous than the wedding party from this previous post. Of the over 100 people who were attacked in 1911 only two survived and had done so by sacrificing the rest of the people one by one as they fled. The final details of this 1922 tale from South Slavia are a little unpleasant though, aren’t they? Yesterday’s post was about the bite of a tarantula supposedly causing people to dance uncontrollably* until the effects of the venom was reversed by the “Guild of Tarantula Players”, for a hefty fee of course! 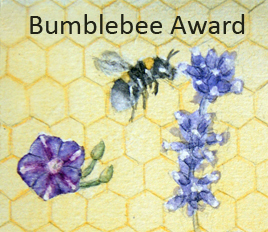 Today’s post is again about tarantulas and music. This time, though, it is a tale of tarantulas that love music. 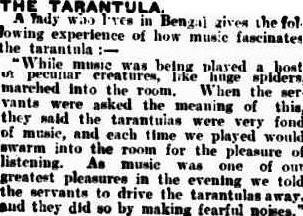 A lady living in Bengal in 1922 reports that when music was played in a home she was visiting, ‘a host of peculiar creatures, like huge spiders, marched into the room’. Eeeeek! When the servants were questioned they explained that the spiders enjoyed the music so much that whenever it was played they swarmed in to listen. Hmmm…. If that was my house music would be banned! Banned I tell you! Alternatively I could give everyone some sort of spider-flattening weapon and turn on the radio. All would be expected to take out as many music-loving arachnids as possible. I would probably need to book a carpet cleaning in advance though, wouldn’t I? *In the comments it was pointed out by a more logical mind than mine that the dance mania attributed to tarantula bite was probably caused by ergot poisoning. The Iconic Melbourne Cup. 1922. The Melbourne Cup is an Australian icon, not just the event, but the actual cup itself. When I was looking for an article about it and found this picture of the cup I realized how instantly recognizable it is. 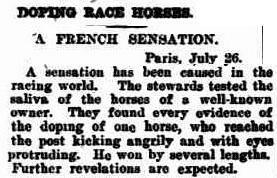 The Melbourne Cup was first run in 1861 and ornate trophies were awarded on a more or less random basis with years when nothing was awarded at all. 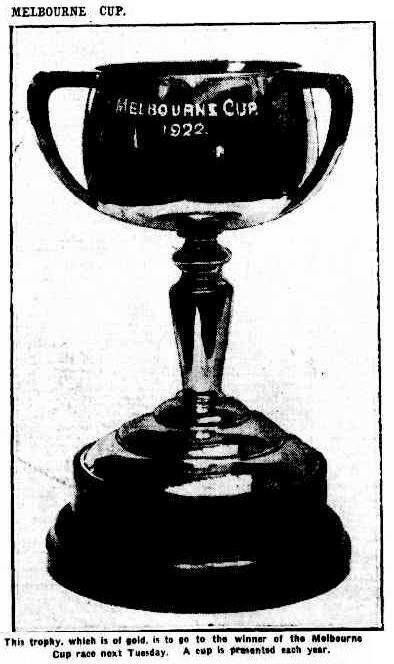 The cup was first produced in this style in 1919 and is the same as the one the owner of the winning horse will receive in 2011. It is currently valued at $125,000. The trainer, jockey, strapper and breeder will also recieve smaller scale copies.